Habitat: Semi arid plains among scrub vegetation, underground burrows in large groups of up to 30 individuals called a gang or a mob. Meerkats have a matriarchal society. One dominant female and one dominant male produce most of the offspring. Although they are excellent diggers, meerkats usually live in burrows dug by other animals such as ground squirrels. These burrows will have an average of 15 entrance and exit holes with tunnels and chambers at several levels with some as deep as 6.5 feet (2 meters). Meerkats have scent pouches below their tails and will rub these pouches on rocks and plants to mark their territory. They have dark patches around their eyes that act to cut down on the glare and help them see far into the distance. Meerkats are diurnal. Once the sun is up, they will carefully emerge from their burrow and spend some time sunbathing and grooming. In addition to taking turns acting as watch guards for predators, meerkats also share the duty of raising the babies, called pups. 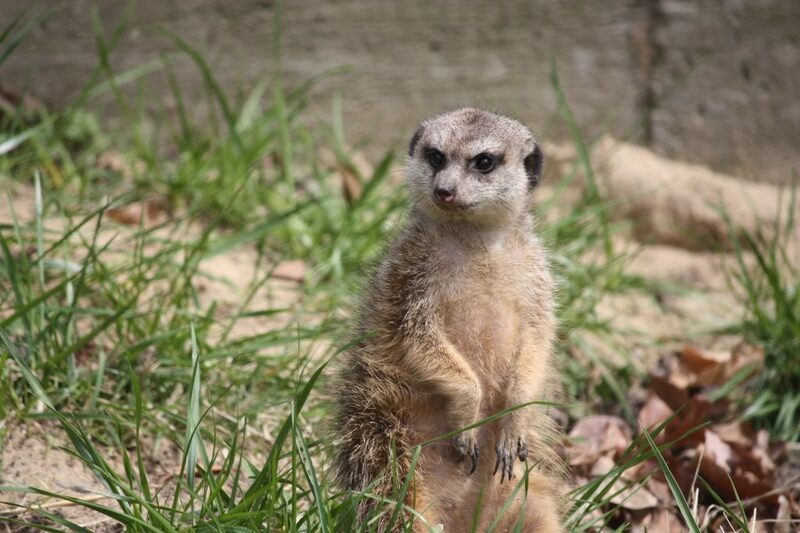 The meerkat’s body length is 12 inches (30 centimeters) and females are slightly larger than males. They weigh 2 pounds (950 grams). Meerkats eat insects, spiders, snails, rodents, birds, eggs, lizards, and scorpions. Because meerkats carry rabies, they have been hunted and even gassed in their burrows particularly in areas where they pose a threat the humans. Scovill Zoo has meerkats from the Knoxville Zoo, the Hogle Zoo in Salt Lake City, and the Gladys Porter Zoo in Brownsville, Texas. Male ferrets are called hobs. 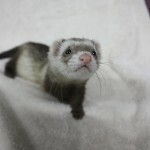 Ferrets also have a keen sense of smell and hearing. Their lithe, flexible and slender bodies allow them to chase mice and rats in burrows. They make shrill screams when fighting, but are curious and playful. They have a long tail and because they are a mustelid and related to the skunk and badger. They have musk glands that produce very strong scents. European ferrets are carnivorous and eat mice, rats, small mammals, birds, reptiles, and amphibians. They are 14 to 18 inches long and weigh between 2 and 4 pounds. The number of European ferrets are dwindling but still at a stable level. Their smaller numbers are mainly due to habitat loss and an increase in human activities. The species is mostly domesticated. The European ferret’s close relative, the Black-footed ferret is still highly endangered, but do have a conservation success story. Black-footed ferrets were once thought to be extinct in the wild. Just over a century ago, hundreds of thousands of black-footed ferrets, and five billion prairie dogs, made their home throughout the North American prairie, which stretched from southern Canada to northern Mexico. When the plains were settled, ranchers saw these grass-eating prairie dogs as competitors of cattle and killed them by the millions. As prairie dogs disappeared, so did the ferrets. Prairie dogs are the ferret’s primary prey, and only two percent of the original prairie dog habitat remains today. Now the black-footed ferret is one of the most endangered animals in the world, but with the help of breeders and zoos it is on the road to recovery.